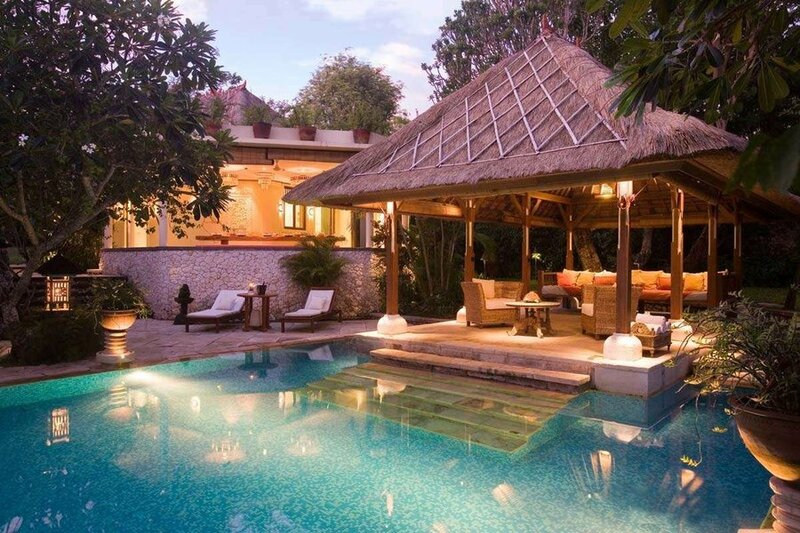 Set within an exclusive neighbourhood upon the hillside slopes at Nusa Dua, this well appointed 'semi-mansion' features all the qualities of a tropical 5-star resort. Just 10 minutes from the international airport and only minutes away from a famed resort golf course, beaches, beachside cafés and restaurants at Nusa Dua and Jimbaran Bay. 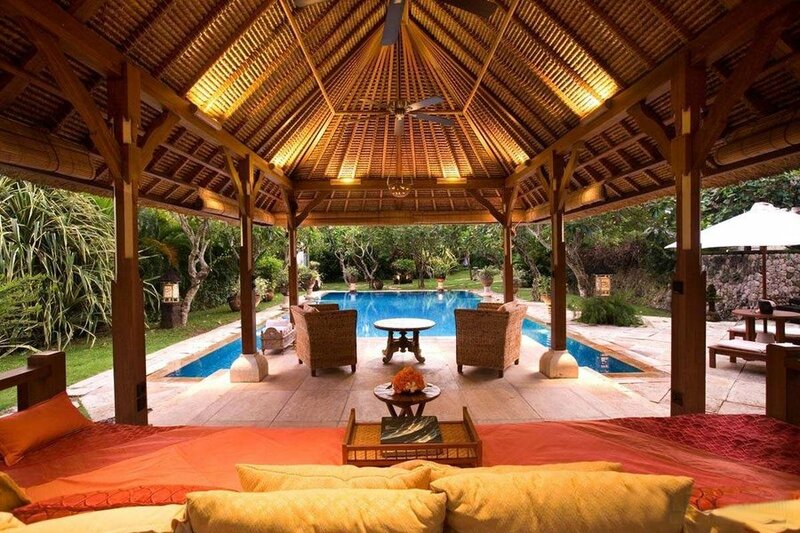 Although recently built, this well appointed villa has a timeless quality, reminiscent of days gone by with it's stone pathways and palettes of Balinese pavilions placed dramatically amidst lush tropical grounds with exotic trees, scented flowers and numerous garden surprises. Entry to the compound is through a set of well-dressed carved teakwood gates - off a private car parking area with 24-hour security. Sandstone steps lead to the main reception area of the living pavilion with sweeping views of a large 20-metre square swimming pool and gabled poolside courtyards. The reception area features a collection of colonial style furnishings, while dazzling paintings and lithographs decorate the walls. 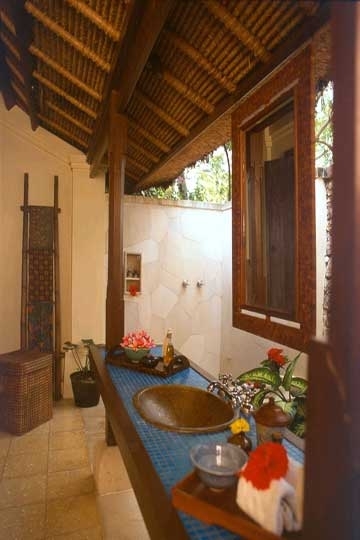 From this area is access to an air-conditioned entertainment and video room - via a set of Balinese carved wooden doors. 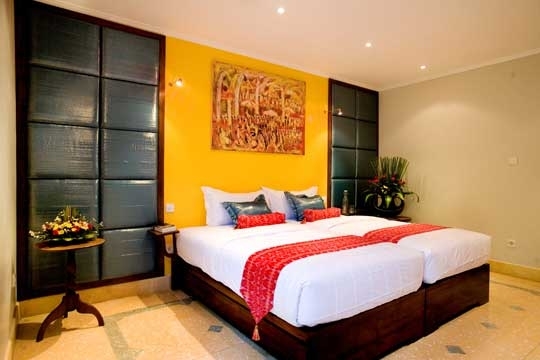 The room features a beautiful Chinese opium-style daybed and a state-of-the-art entertainment wall with a 50cm satellite television, DVD player and a library of books, movies and games. A colorful children's room with a set of double bunks and an en-suite bathroom is through another set of double doors from the entertainment room. The first of two large master bedrooms is located on the lower level and is accessed through a set of large teakwood double doors. It comprises a grand canopied king-size 4-poster bed, two large antique armoires, a private verandah and a large en-suite garden-bathroom. 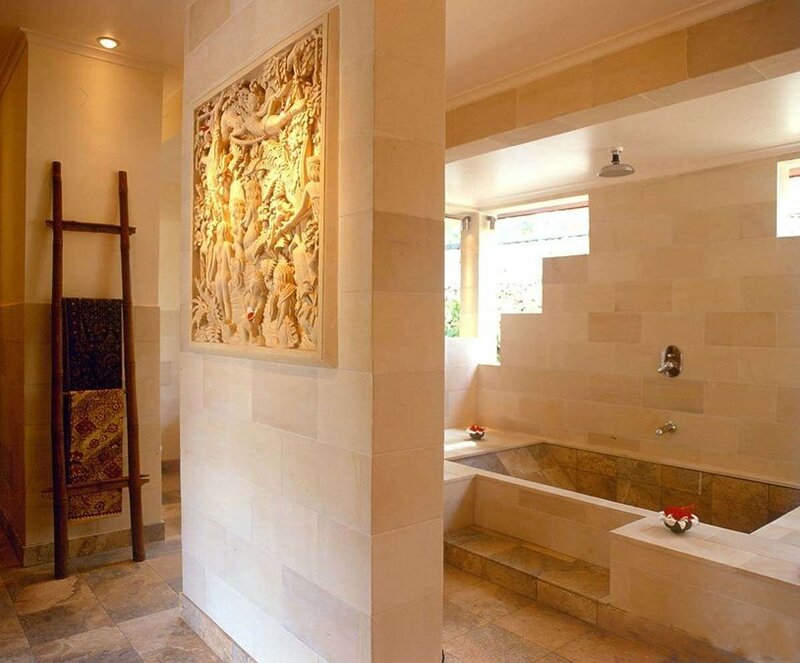 A second master suite is located on the upper level - via a stairwell leading from the main living pavilion - featuring a canopied king-size bed, walk through dressing room and en suite bathroom. Also on the upper level is a large cocktail verandah under a high thatched ceiling with comfortable sitting areas, private bar - with additional facilities for dining - all overlooking the courtyards, gardens and pool. Within the perfumed gardens is a separate air-conditioned guest pavilion with a king-size 4-poster bed and en suite bathroom, which overlooks a tranquil Koifish lotus pond. 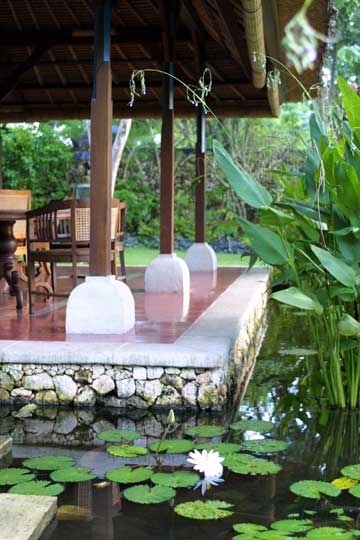 Adjacent to the pond is a traditional open-air dining pavilion offering views of a central lawn area which features several antique Balinese stone-carvings, sandstone stepping stones and a fragrant lily pond. In addition, there is a dining Bale (pavilion) built of natural stone with lily ponds to each side; a detached kitchen with modern appliances; and a tranquil pool Bale from where one can hear the tinkling of water flowing fromsix vases around the large pool. We are very proud of our garden designed by 'Stranger in Paradise' Made Wijaya alias Michael White, architect, writer and landscape garden designer. 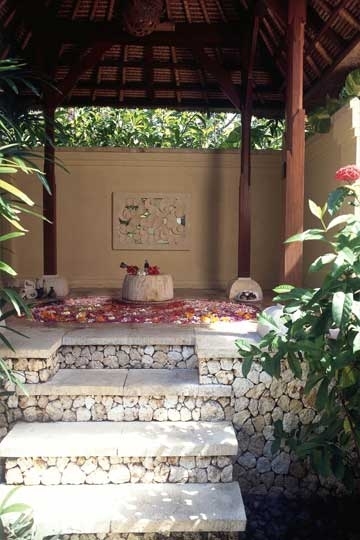 We have given particular attention to the tropical gardens with its native plants and flowers, lotus and lily ponds and ancient stone carvings. Villa Waru is situated within a residential compound where the roads are quiet and one can stroll or children can bike with limited road traffic. The neighbors are very friendly. Bali is safe and tourism is being developed wisely where much of Bali's unique culture remains in tact. For instance, you can see beautiful flower offerings every day gracing our home. A welcome pack with tourist information will be provided upon your arrival. Credit value depends on season as well as how many rooms are being used by the visiting party. Villa Waru is staffed with a House Manager, cook, house boy, house girl, gardener and 24-hour security guards. 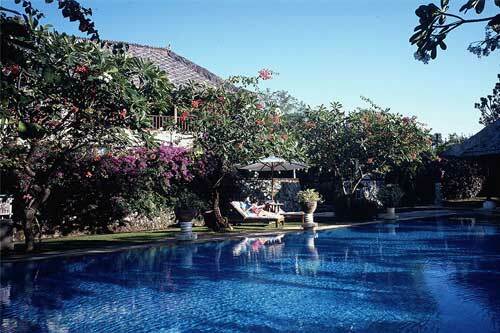 They are all fully trained to meet the needs of the guest, ranging from preparation of both Indonesian and western delights to maintaining a very clean estate to respecting your privacy. There is a service charge for the above staff of Rp 200,000 (aproximately $20US)per day per couple/family Meals are offered at cost of groceries, plus 25% to cover procurement, preparation and presentation costs. Rp 350,000 (US$ 40) for car and driver per 9-hour day or $35 for more than 7 consecutive day rentals. Pro rated up to 4-hour segments. Additional cars can be arranged. Baby-sitting service. Rp 25,000 (US$ 3) per hour. Fax service (nominal charge). IDD phone card Rp 250,000. Massage / spa / tour / excursions can be arranged. Just 10 minutes from the international airport. We can arrange a driver with car who can pick-up at the airport and drive around town. Our group of five adults and two children stayed in the Garden Residence over Christmas break 2009. 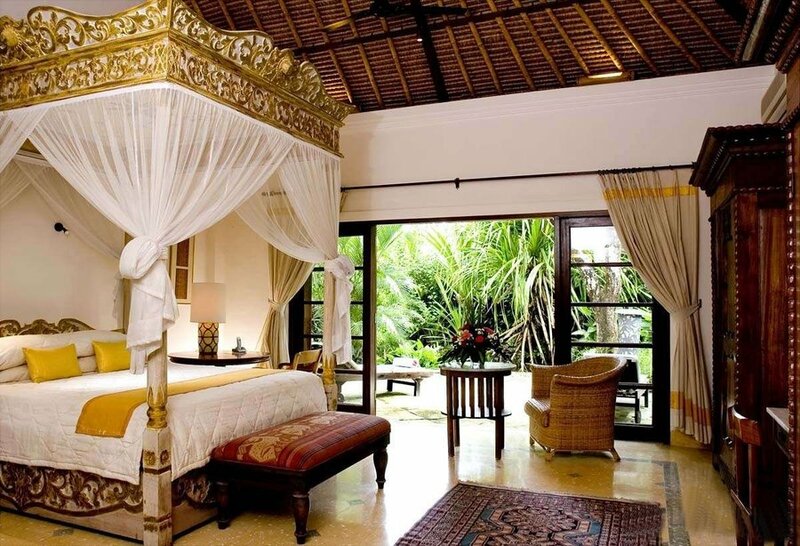 The property is a fine example of traditional Balinese architecture implemented in a very comfortable, modern style. Eye-pleasing details are everywhere, and the place is flawlessly maintained. The saltwater pool was fantastic. We enjoyed our visit very much.